A two or three-year technical theatre course at a drama school is still viewed as the traditional route into a career in technical theatre. But with fees now typically starting at £9,000 per year, plus living costs on top of that, a full-time course is an option for fewer people, who are likely to come from decreasingly diverse backgrounds. This means that support for the many people who work, or aspire to work, in technical theatre without training is increasingly important. A number of professional associations are taking up the challenge of offering support structures for those looking to take non-traditional routes into a career in theatre. In February this year, the Association of Sound Designers created a new membership category: future professional membership. This encompasses what was formerly known as student membership, but is also open to those who are starting out in the industry but have not trained. Many senior figures in the technical theatre world didn’t train. One example is sound designer Ben Ringham who, with his brother Max, has composed and designed for theatres across the country, throughout the West End and at the National. His journey started at 16 when he left school and took a job as a dogsbody in a recording studio, before moving on to make his own music. Composing was followed by working with his sister Hannah’s theatre company Shunt in its space at London Bridge. He talks of the way they learned on the job as “a baptism of fire”, but recommends that aspiring designers “find an immersive theatre group and get dirty for five years” as a way of learning the trade. There is also a strong precedent for experience in amateur or student theatre providing a launch pad for a professional career. 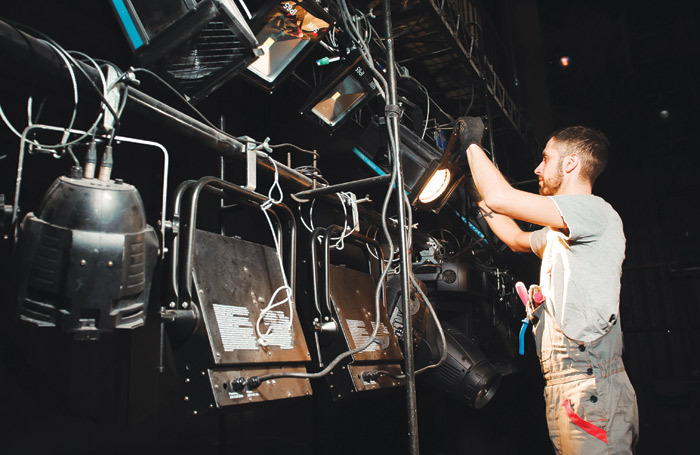 West End lighting programmer David Ayton describes how experience at school and university led him to leave his degree to pursue lighting professionally. Theatre company Part of the Main looks to open up experience-based paths into the industry with its Part of the Grid workshops. These two-day courses are designed to give people who are interested in technical theatre a chance to be hands on. Olivia Munk, artistic director, explains: “It’s aimed at those who are out of education and don’t have access to the resources provided by schools and universities.” At £60 for the weekend, or £40 for a single day focusing on either sound or lighting, it is an affordable way to get an initial feel for the work in a safe and supportive environment. For a more comprehensive course, the Association of British Theatre Technicians  offers a week at venues around the country. These encompass manual handling, electrics, rope work, an induction to flying and working at height in a variety of ways. The course has three levels – bronze, silver and gold – each of which is designed to build on the skills learned previously. It is also possible to take a single day of these courses if your interests lie in a specific area. You do not need to be an ABTT member to take part, though the discount given for being one – £696 rather than £816 for the week – covers the membership costs and would allow you to take advantage of the additional benefits that brings. Membership of a professional body relevant to your future career can be an invaluable resource. While the terminology is different from that of the ASD, both the Association of Lighting Designers  and the ABTT have memberships that are available to those starting out, whether or not they have training, while membership of the Production Managers Forum is open to all. These memberships are all under £50 for emerging professionals, or (even better) free in the case of the PMF. These bodies all offer ad hoc platforms and development opportunities that support members in building their skills base. The ABTT offers a range of downloadable information on topics ranging from CDM legislation to pyrotechnics. The PMF has run platforms in rigging and financial management, and has plans for events based around sustainability and the Disability Discrimination Act in the new year. The ASD runs regular seminars covering topics including sound content creation, music, acoustics and software; an archive of more than 40 of these is also available to members via its website. Each year the ALD presents the Michael Northen Awards , which are open to both student and affiliate members; it is not necessary to have been studying lighting design to enter. Having first got into theatre as an extra-curricular activity while at university studying engineering, Fernandes now works as a self-employed lighting designer and production manager. He also runs a course called Technical Theatre for Non-Technical Creatives to support directors, choreographers and performers to communicate better with their designers and technicians. All these organisations have regular social events for members and the opportunity to build connections is one of the most valuable things they offer. Most technicians who have not trained, and many who have, credit the networks they have built as their main source of career development – both in terms of getting work and learning more about how to do it. These connections can be easy to make, but, without knowing where to start, it can be daunting. As Ringham puts it: “It is important that people know there are ways in”. These bodies are full of the people who can show you those ways.